This climber-owned house is truly a great choice for your Montserrat-visit! Not more than 10-20 minutes by car and you’ve reached most major sectors of the mountain. If you want to see other climbing areas you have not more than 45 hour to Sant Llorenc del Munt and about one hour to the Berga-area. The closest good bouldering area is reached in 15 minutes and the Lleida-area in about 1 hour. For your rest days you can reach very nice beaches in 45 minutes and Barcelona in about 1 hour. 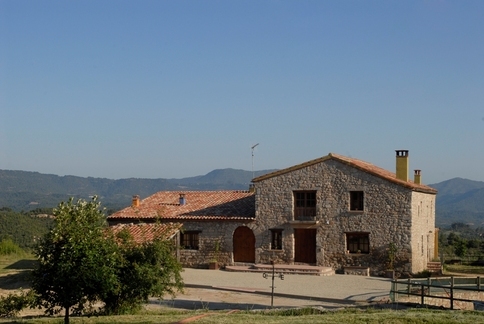 The house is an old wine farm that has been completely renovated from bottom to top. Local materials have been used throughout and the house is self-sufficient in water collecting rainwater. The water is then heated using solar panels. The house is heated from the local forest. The owners live on the estate and will be happy to tell you more about this and of course to assist you in any climbing-related matter. Ground floor: 1 hall, 1 kitchen diner (fireplace, oven, microwave, dishwasher, fridge freezer), 1 utility room (freezer, tumble dryer, washing machine), heating (floor heating). On 1st floor: 1 corridor (french doors, patio (fenced, roofed, private)), 1 livingroom (single sofa bed, TV, VCR, DVD player, CD player), 1 dining room, 1 bedroom (queen size bed), 1 bedroom (double bed or 2 single beds), 1 bathroom (shower, washbasin, toilet), heating (central).